The rains came unexpectedly early this month, and while we got a much needed reprieve from the scorching summer heat, it suddenly grew from a light drizzle to a full blown thunderstorm. Laundry drying on rooftop lines flew away, window panes shattered, trees were uprooted and there was all kinds of chaos. Meanwhile in our Achen’s (uncle’s) mango orchard, thousands of plump, little green mangoes that he had nurtured with love and compost, chasing away crows and rampaging monkeys, waiting patiently for them to ripen to their full potential and turn golden, sweet and delicious, fell to the ground. Farmers are used to such heartbreak and I imagine that he stoically gathered them up into gunny bags to distribute to his neighbors, family and friends. These mangoes would not ripen and were not worth taking to the market. His silent disappointment perhaps filled up the sack of green mangoes that he sent to us, too.They were mouth puckeringly bitter and too sour to eat. My sister would have disagreed, dunking chunks of green mango slices into red chili powder and salt and enjoying the contrast of spicy and tangy. My mother in law had them brined to temper the sharp edge of their bitterness, and made pickle, green mango chutney and fish curry. We were determined to relish every single mango Achen shared with us, as if to somehow make up for his loss. I made aam panna granita. Tingly, sour-sweet and mildly spiced, this refreshing summer drink is perfect enjoyed in the form of icy flakes that melt in your mouth. Aam panna, is a very popular summer drink made with green mango pulp, infused with spices and pungent black salt. It is known to have cooling properties, in addition to aiding digestion and being full of vitamin-c. I tasted it for the first time when visiting a friend in Delhi almost a decade ago. After being out all day in the intense Delhi sun shopping for fabric at the bustling Sarojini Nagar market, we got back to her home, hot, sweaty and tired, to be greeted by tall glasses of this weird looking, speckled yellow-green drink that her mother had thoughtfully made for us. The drink was cool and refreshing as it flowed down my parched throat, the then unfamiliar flavors of black salt and cumin dancing on my tongue. In aam panna the often underappreciated green mango is celebrated for what it is: tantalizingly sour with just a slight hint of sweetness. Summer is meant for aam panna and is even better with aam panna granita! It’s refreshing and cooling abilities get kicked up a notch. Try it, you will never again look at raw green mango with scorn or impatience, wishing they were ripe. Cook until they are soft and mushy and the peel comes off easily. Add sugar, spices and salt and heat the strained pulp on simmer until all the sugar has melted. Store the cooled aam panna mix in the fridge. When ready to serve, pour the aam panna mix into a glass to fill it about a third, fill the rest of the glass with water. Stir, adding some lime juice and muddled mint leaves if desired. Once the drink is frozen solid ( in a couple of hours) scrape and break it up with a fork into fluffy, flaky ice crystals. Enjoy either as spoonfuls or slurp up with a straw! The next time I make this I will definitely try spiking with a little vodka and a green chilly or two! I can't believe its already another Easter. We have settled in well, back home here in India, after moving from our beloved Marin ,that I still miss dearly, but now, no longer in that heart-gnawing way, more as one remembers a beautiful dream. We have been busy in our new lives here, catching up with family and friends, taking little trips to rediscover and fall in love all over again with our beautiful and colorful country and getting the kid settled into school here (the same one his Pappa went to! ), and I did neglect my beloved blog. Easter and Spring is a time of renewal and rebirth, so here we are! I have much to share,and I am finally ready to get back to blogging. I have been cooking and baking a LOT but somehow, in the hustle and bustle of our new life here, just didn't get down to writing and posting here. 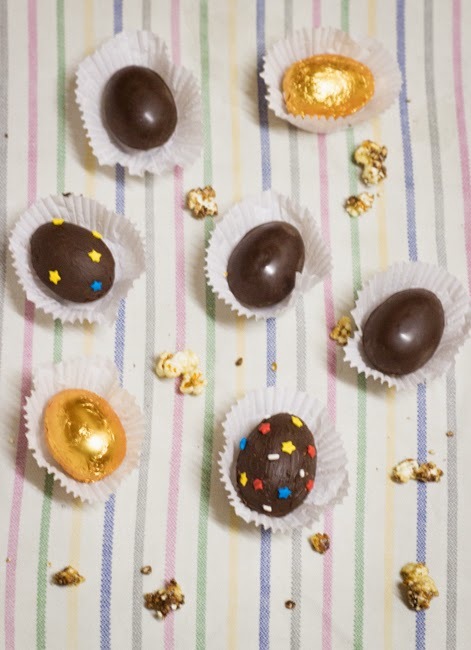 These delightful sweet and salty, crunchy caramel popcorn filled Easter eggs though, were such fun to whip up, I just had to share in case you have an Easter egg hunt planned for the little bunnies in your life this week. 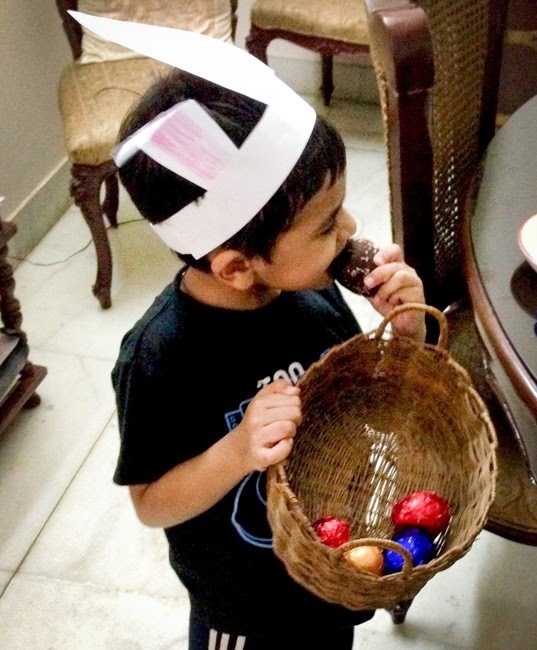 Growing up, sometimes we got Easter Eggs filled with candies from the local bakeries in Kerala. Those were usually made of a hard and dry fondant or gum paste and elaborately decorated with piped flowers. They shattered when you broke them, and spilled the treats within. 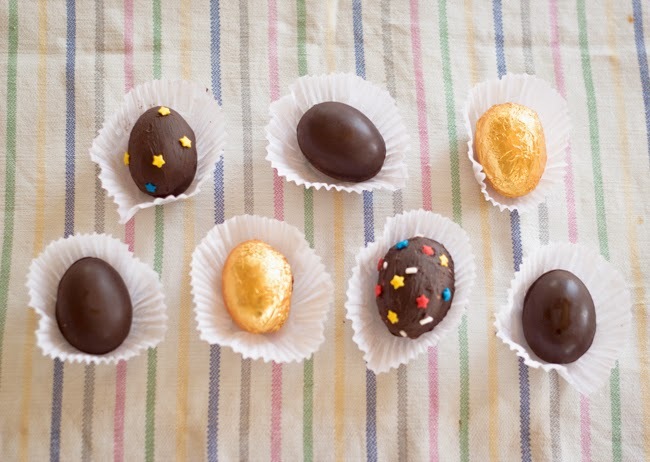 These chocolate eggs are fully edible though, and totally delicious! The bittersweet chocolate I used contrasted well with the sweet and salty caramel popcorn and my little bunny loved the crunchy eggs as well as the hunt to find them all! 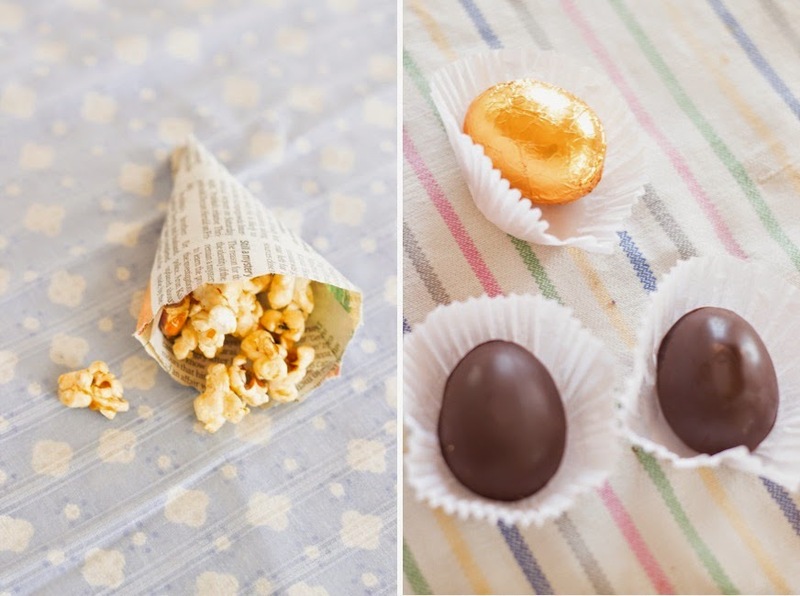 Ok so you don't really need a recipe to fill an egg mold with melted chocolate and fill it with caramel popcorn, so this is more of a sharing of an idea! Chop chocolate ( I used about 400 grams of already tempered chocolate for about 9 eggs) and melt in the microwave in 30 second bursts stirring until chocolate is fully melted. Pour about a teaspoon into mold and swirl it so it evenly coats the inside and let set in the fridge. Repeat this about three times so that you have a strong shell. If you find the chocolate firming up, just microwave again for a few seconds more. Now fill with caramel popcorn chopped into small pieces. Make sure no pieces of popcorn are jutting out of the egg half. Cover the popcorn pieces with a final coat of chocolate and swipe the top with a spatula or knife so that it is even. NO bumpy tops. Let set again in the fridge for about 10 mins till fully solid. When you try tapping the mold, the egg halves should pop right out, else give it a few more mins in the fridge. Affix two egg halves with some melted chocolate to make a complete egg. You can also adhere some sprinkles on with a teeny drop of melted chocolate. Hey! How are you all doing? We have just a few short weeks before our big move back to India, so things are pretty crazy around here. We sold some of our furniture and gave away the rest of our stuff that we had accumulated over the years. Surprisingly I did not feel much of anything to see them go, except an unexpected sense of relief. The kid was quite confused when they hauled the sofa away but immediately reveled in all the new space he had to run around! I am trying not to let go of most of my kitchen stuff though, and that is what I am packing first, forget clothes and shoes! My baking pans are covered in bubble-wrap and packed away in suitcases and I am itching to bust them out, and bake one last time before we leave. (I didn't take my camera along so this picture is from an earlier trip up to the breathtaking Marin Headlands.) Initially, to me, The Golden Gate Bridge was just a pretty red bridge, but over the years I formed a deep attachment to it, and so has the three year old who's whole face lights up every time we see it. Driving up to the city it is always an awe inspiring sight to see the bridge shrouded by fog and surrounded by the green hills, just as we emerge from a tunnel. A truly dramatic sight I can never get tired of, and always have to photograph and then of course share with you all here! I am sure you don't mind :) Just look at that! We must be pretty crazy to leave right? As you can guess, I am already missing California deeply but I just cannot wait to be all settled in my next kitchen on the other side of the world, and get cooking & baking again. I can't wait to re-discover Bangalore, the bustling South Indian city we are moving to. It has changed so much from the green and quiet little town I once lived in long ago as a child, and over the years that we have been away, I am sure it has changed even more. But before that, there are hundreds of things to wrap up here, and a loooonnggg 30 hour trip to make. Do say a prayer for us and send good wishes our way! So what am I doing here? escaping my never ending to-do list for just a little while, with a delicious and beautiful apple tart dusted with fennel pollen. It looks like a flower in full bloom doesn't it? 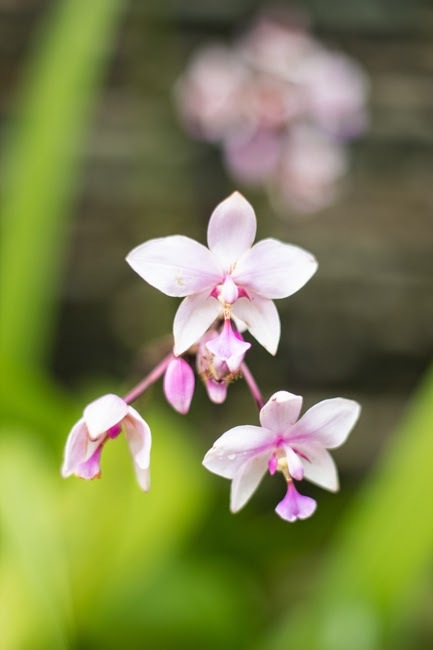 Like these gorgeous spring flowers- something else I just cannot stop photographing! 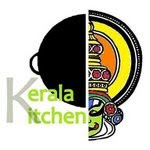 This is a guest post for my good friend Viji at her blog Spices and Aroma, which always inspires me to cook and eat healthier. You will find Viji cooking with a lot of whole grains, South Beach diet friendly recipes and also making some absolutely brilliant, not so sinful desserts. Then one day when I was flipping channels on the TV, my three year old surprised me by loudly exclaiming "that's Pepin!" on seeing Jacques Pepin! A little later, he also confirmed that he was familiar with Julia Child. We are a little addicted to PBS, him and me, and I am so not proud of the fact that he can name most of the characters of "Downtum Abbey". Anyways, Pepin on that day was making a tortilla-tart with pears that looked so delicious and easy, that I could not resist making it, and decided to use up the last of the pink lady apples that were a steal at our farmer's market, perhaps because they were on their way out. Since it is quite healthy too without all the fat and sugar that goes into most tarts, I thought this is just the sort of recipe that Viji would like- not so sinful and bound to be a hit with her little toddler too. I also decided to test some of the fennel pollen I received as a sample from the wonderful people from Pollen Ranch whom I met at the Fancy Food Show and got to learn a lot about this spice that I had not used before. Most of us are familiar with fennel bulbs and of course fennel seeds, which are widely used in many cuisines, and very common in Indian cooking. Fennel is one of my favorite spices, both in savory and increasingly, sweet uses as well. In India bowls of fennel seeds are offered after meals to refresh your palate, aid digestion and serve as a natural mouth freshener. So that is my association with it, fresh, sweet, slightly anise-like. But what is fennel pollen? As you would guess, it is the pollen collected from flowers on the fennel plant. I was expecting it to be like dust, but it is more granular than powdery, and tastes sweeter and less anise-like than fennel seeds, at-least to me. Fennel pollen from Pollen Ranch is hand picked from fields of fennel growing wild in the Sonoma area. I was intrigued to learn that fennel grows wild throughout much of California and the US West Coast. I hope to visit those fields one day and would love to watch how they harvest it. In this easy tart, left over tortillas or rotis are spread with a tablespoon of butter or margarine and sprinkled with sugar, instead of using a regular tart shell. Slices of apples or pears are arranged on the top, dotted with a little more pieces of butter, sprinkled with spoons of sugar and a pinch of fennel pollen, and then baked at 400 F for about 20 mins until the sugar and butter form a fennel scented caramel over the softened apples. The top of the apples are brushed after baking with preserves or honey that make them look shiny and glazed and adds just a touch more sweetness. The roti gets baked into a crisp and crunchy sweet base. Easy, delicious and pretty all in one go? Ingenious! Head over to Viji's blog Spices and Aroma for the full recipe and a lot of inspiration to eat healthy! Hope this beautiful Spring-time opens up our hearts and fills it with love, and LIFE! Happy Easter & Happy Spring my friends! Congratulations Amy, will be contacting you for your address. Thanks to everyone who participated and to Gitadini for offering this giveaway to us. Lemon Couscous Spring Chicken In a Pot- and of goodbyes and new beginnings! Spring has very loudly announced her presence for a while now, around here. Little shoots poke out from the ground and buds burst open into a riot of colours. Tree branches that had nothing more than barren twigs, are covered with pink petaled flowers almost overnight. I made a trip to our beautiful farmer's market here in Marin along with friends Patty and Gina recently, and we were greeted by piles and piles of bountiful produce, that has come to life after the cold death of winter. Bright orange carrots and pretty radishes freshly dug from the brown earth. All around me, visible signs of change, new beginnings, rebirth. Today is Good Friday, the solemn day we remember the death of Jesus. But it is followed, like Spring follows Winter, with the greatest celebration in the Christian calendar- Easter, this Sunday. As we prepare to celebrate Christ's resurrection after His death, we are reminded of our own resurrection after our life here on Earth is done. Reminded that our troubles, achievements and everything here in this life is only temporary- a passing mist, compared to our everlasting life to come. The Jewish festival of Passover falls at the same time, and symbolically the two events are linked- Christians believe that Jesus Christ was sacrificed as the pascal lamb that was traditionally slaughtered for Passover. That Jesus, the son of God was crucified, accepting unbearable suffering so that each and every one on the earth, would be forgiven for our sins, and saved. He paid the price for our souls, taking on the punishment each of us deserve for our sins. Of course, this does not mean that sin does not have consequences What it means is that while we are here on Earth, we have the opportunity to confess our sins and avail of God's grace to "fix" ourselves and our lives, and resolve to sin no more. To put our past behind us, and start afresh. As we celebrate new beginnings, there are going to be some major changes and new beginnings in my own life too. We have been considering this decision for a while, and it had become something we thought of as being inevitable, eventually, but somewhere at the back of our minds. Recently however, God aligned things to make this decision for us: We are moving to India! Soon, much sooner than we had initially planned. I am very excited but honestly, equally anxious. There is SO much to do and I wish we had more time to do it. I dread my long to-do list, I dread the packing, the planning, the starting from scratch. I just want to hide and pretend that it will all take care of itself! There is furniture that will hopefully get sold, the letting go of so many things that I had accumulated and grown attached to. I hope this hard exercise is going to teach me to finally do something I strive to- to live simpler, to own less, to be less attached to mere things. Less to store and maintain, less to clutter and clean up after, less to carry around. Let's hope this resolution holds! But in all this confusion, I feel God's hand guide us, helping me strike one more thing off my list, and then another. When I am anxious, I remember to surrender. I am one of those people who hate change so it took me a while to get used to the very idea of the big move. I thought about everything I would miss. I will deeply miss our beloved farmer's market, the wonderful library, the long walks with my little man to the duck pond close by, the hills outside my window. I will crazily miss being only a short ride away from the cuisines of Argentina to Ethiopia and Vietnam and our regular barbecue picnics by China Camp State Park. Seeing my beloved Golden Gate shrouded by fog. I will dearly miss the friends we made here, and I know my little man will miss his friends here too. Another half of me though, is growing more and more excited by the day. Excited about meeting up with family and our dear old friends whom we haven't seen in too long a while. One of my favorite cousin's wedding is on the day after we land and I couldn't be more thrilled that it is one wedding we won't have to miss! Looking forward to being steeped in tradition, colour, and chaos! I look forward to experience the wonderful food of my home with fresh eyes and to learn more about Indian cooking while I also try to recreate the food I enjoyed here. I look forward to wandering around the busy, colorful and crowded markets there and drinking cutting chai by the road side. To enjoy sweet golden mangoes and mangosteens from my grandmother's garden. Lots to look forward to, hopefully even more beautiful than the wonderful years we will be leaving behind. This means that things might get a little quiet around here, as I force my self away from the laptop and wrap up some stuff, but I will be back soon with new stories! And I won't be able to stay away from facebook or instagram or twitter and will probably be bombarding you with minutia leading up to the big fat move! To all our friends here: I hate saying goodbye, so I won't. See you in South India my loves, let me be your tour guide! To all the old friends we are meeting and the new friends I hope to make: I. Cannot. Wait. In celebration of Spring, while its still not very warm in most parts of the country, here is a one pot chicken dish adapted from Dorie Greenspan's Around My French Table: More Than 300 Recipes from My Home to Yours , which is very simple to make so is perfect if you are looking for an easy to throw together, yet dramatic Easter dish. It makes the best of Spring veggies and you can drop in what ever you have on hand. Carrots, cabbage, caramelized shallots and garlic, everything is just sublime cooked along with the chicken. I had to experiment and add my own touch so added some lemons which add a wonderful tangy brightness and served with some couscous that readily soaked up the glorious chicken "gloop" as Dorie calls it. This dish is a truly wonderful thing, way awesomer than the sum of its parts. Flavorful and bright from the lemon, it is a great way to finally welcome Spring! Then heat oil in a skillet and brown a whole chicken that has been patted down ( Remove the giblets and if you like, the skin as well- I did) and seasoned liberally with salt and pepper. No need to cut up the chicken, or you can use some chicken thighs instead of a whole chicken. Place wedges of cabbage and lemon as much as you can fit into your pot around the chicken. Stir together a half a cup of wine, half a cup of olive oil and a cup of chicken broth ( or water mixed with bullion) and whatever herbs you like- I just used some dried oregano and thyme because I didn't have any fresh herbs, and pour this over the chicken. Then I just covered my pot with a tight lid, but Dories makes a flour-paste to seal the lid, or suggests using foil to cover the pot tightly. As Dorie promises, the chicken bakes up to be fall apart tender and gosh so amazingly flavorful The juices or "gloop" is definitely the best thing about this dish, and the couscous and cabbage that magically soaks up all this flavour gets finished off first! Seriously don't skip the cabbage even if you are a cabbage hater. It transforms into something truly amazing. And I definitely recommend adding the lemon-made the chicken taste tangy fresh and just perfect for Spring! Reminder: There are only two more days left to enter the giveaway for a very useful straining saucepan by Gitadini so don't forget to stop by and leave your entry if you haven't already! I had just moved into an apartment with a kitchen during my student days. I barely knew to cook and along with my roommates had just set up our kitchen- a rented fridge, a small gas stove and a toaster oven and a few pots, pans, spices and bags of lentils we had each brought from our mother's kitchens. We were all set and felt so grown up, even though none of us had accomplished cooking anything more than rice and dal, and that was dinner on most days. We didn't really feel the need to learn anything more, as when we got tired of dal, restaurants delivering delicious and cheap but greasy food right to your home and even home cooks who brought healthy, homemade meals for us "bachelors" (and bachelorettes) were only a phone call or a short walk away. But on that rainy Sunday, my roommates and I were stuck at home, with a yearning for masala chai. Masala chai or spiced ginger tea is popular and easily available at tea stalls all over India. It tastes best drunk out of little cut- glass tumblers on a crowded street full of life and color and is a great picker upper when you are tired after a long day, or a chilly, rainy one. On that bleak, grey morning many years ago, we began to talk about masala chai and I grew increasingly desperate for some. The only problem was that I had no idea how to make tea, so I had to look it up in a cookbook, (my first ever), a used copy of Modern Cookery picked up on a whim from a pavement book seller near Besant Nagar Beach, because I remembered seeing it on my mom's bookshelf. Luckily we found a bag of loose tea leaves and the required spices among the stuff our mothers had packed for us and I followed the steps that included filling a saucepan with "fresh bubbling water" from the tap. Thank you and your detailed instructions Thangam E. Philip! I boiled milk along with twice the amount of water, added a piece of smashed ginger, pepper, cloves, cardamon and cinnamon on our little stove. I waited until it came to a rapid boil, then threw in a teaspoon of of tea leaves for every cup of tea as Ms Thangam instructed me to, then turned down the heat and let it simmer and then boil alternately until the tea and spices infused the tea with warmth and strength as I had seen the chaiwallahs ( tea stall man in North India, called chaya kada karan in the South) do. That first cup of tea was absolutely wonderful, and soon my roommates and I discovered that a steaming cup of spiced ginger tea and a warm piece of toast spread with cold butter or jam was one of the best things in life to wake up to. For some reason I became the official chaiwallah of the house, followed by which I soon mastered or atleast became familiar with cooking some simple things. Ofcourse there were lots of disasters too, and sometimes even today, but they all help me learn what not to do! Many years have passed and I no longer need a cookbook to make chai, and today, cooking is no longer a necessity for me, but more of an obsession! Whenever my mother in law comes to stay with us, tea and toast is our little ritual that we share before we begin the day and whenever the weather is chilly, and especially when one of us is fighting a cold, she asks me to make my "special" masala chai. The steam opens up blocked nasal passages, and the spices soothe and heal a sore throat. Along with Mummy's special blend of homeopathic remedies, a warm cup of the masala chai is sure to chase away colds. This masala tea concentrate is for those days when you need that spicy kick in your tea, but are short on time. I boil the spices in water before hand, cool the liquid and store it in a bottle in the fridge. I only make a little at a time, but you can increase the amount to make for the week ahead. Pour it into a pretty bottle and the beautiful golden red liquid would also make a nice gift for the tea lovers in you life. I can also see many other uses for the concentrate,to poach fruits, make into a syrup for desserts, maybe even in savory cooking uses. The GitiaDini Straining Saucepan is perfect for making this masala chai concentrate because it has deep pour spouts and a strainer inbuilt. Such a clever idea, making it ideal to cook rice, pasta, vegetables, soup and anything else that may require pouring and straining, without needing a separate colander or strainer. If you want to strain very finely, ( for example tiny tea leaves) you may find the holes a little large and may want to use a mesh strainer, but for most things like rice, pasta, vegetables and larger spices like those used in this spice concentrate it works great. I wish it came with a lid, but was happy to find that I had several lids from other pans at home that fit perfectly. I like that the sides are also slightly rounded making it easy to stir things and it is just the right size at 2 quarts- making me reach for it often. It has a nice heft to it and is well made. I have had it for about two weeks and so far I have used this pot almost exclusively for all kinds of things and would definitely recommend it. I am happy that the lovely people at GitaDini giving away a Straining Saucepan to one of Magpie's Recipes' readers. The contest will close on March 31st and winners will be announced shortly after and the saucepan will be shipped by GitaDini to any address here in the US. 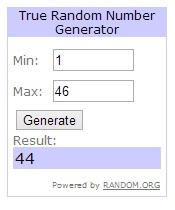 Winners will be chosen using random, so the more entries you have, the more likely you are to win. Make sure you have a US address if you take part! If you want to check out all the other cool products by GitaDini like the Rotito Roti Rolling Board set and the fun Ying Yang spice box, visit their website. Add the spices to the water and bring to a boil on medium heat. Cool,strain, bottle and store in the fridge. Add a tea bag and let it infuse for 2 to 4 mins depending on how strong you like your tea. You can use spices of your choice- (ground nutmeg or dried mint would be a great addition), some people prefer to leave out the pepper as it can be a little prominent. Use a black tea you like to drink, I have used Darjeeling, orange pekoe or even Mummy's favorite Twinings Earl Grey tea. Please note: I received no compensation from GitaDini or anyone else to write this review for the sample saucepan they sent me. All opinions are strictly my own, from the two weeks that I have rigorously used this saucepan. Sometimes there is perfection in the simplest of things. Like a bunch of french beans, quickly sauteed in light olive oil, with a little caramelized garlic and a sprinkling of chilli flakes for heat. Served over rice, with a soft boiled egg, this is my idea of a perfect meal. We eat beans a lot. All kinds. This long beans stir fry is a favorite. And then of course there are dried beans ( lentils) of all kinds. Red Beans and Pumpkin Eriserry, Yellow Dal and Green Mung, and another simple ever-favorite, the humble Horsegram (Muthira) What's not to love about legumes? They are inexpensive, easy and quick to cook, nutritious and delicious. I am sharing this green beans saute with some other legume lovers over at My Legume Love Affair that was started by Susan and is now being run by Lisa, and if you love legumes as much as we do, you should definitely join in the fun. Do you think beans are boring ? Or do you think of magic, and of Jack and the beans stalk? Of something amazing that can come from something so ordinary? Whenever I see beans, I think of my little brother. He is not so little now, but when you have a brother who is nine years younger than you, he is your first baby and will always be. My sister and I and we were fiercely protective of him from the second he was born. While my sis and I went through our share of sibling rivalry and quarrels, with my brother things were different. We big sisters were happy to pamper him. He was just the cutest little kid. Light brown eyes framed by long lashes, and the sweetest, widest smile on his chubby face. Most little girls had dolls to play with. My sister and I were lucky enough to have our own live, little doll! Yes, the poor thing had to go through a lot of tea time, dress-up and worse! I could not believe it when I went off to college and during that time our happy chatterbox grew into a quiet teen who towered over us at 6 feet tall. Today I cannot believe he is twenty, almost done with his studies and ready to join the work force. But once, he was five, and a sweet little boy who, like Jack, had a beanstalk. Well, my mother planted it, but it was the five year old, whose job it was to water it and he did so, enthusiastically. One of my most cherished photographs has a disheveled, chubby little toddler, who (in my mind at least) can never grow up, dutifully watering his beans plant. And that's the image that came into my mind, looking at that bag of beans at Costco. This time I was happy to see a huge bag of tender green beans, and I had only this one thing in mind to do with them- sautee them with garlic, and that's all I did with the entire bag. No complaints. Heat the oil in a skillet and saute the garlic until crisp and light brown. Add the washed and cut beans and stir to cover evenly with the oil. Cover the skillet with a lid and leave to cook, stirring occasionally. The beans should still have a bite to them but no longer taste raw. Serve with rice or as a side to meat or pasta.